Why don't you have a general anesthesia? I have had 3 bone marrows...all of them done while under a general. I wouldn't have it any other way. Reading about your experience made me cry! All that pain and stress is so unnecessary!! It sounds as if the Drs. were inept! Thanks for your compassion! I will never let them do a bone marrow biopsy with being knocked out again! I was shocked when everyone I asked for something, nurses and doctors alike, told me no. I do have a new doctor now at UCLA. I had a bone marrow biopsy done in the physicians office, it - was brutal! Like you, I will NEVER under go that procedure without some kind of anesthesia... Someone I know had one recently, and they gave her an epidural before the biopsy... Anything - is better than nothing... I honestly think Dr.'s that perform this should HAVE IT DONE themselves, and "then" decided whether or not it warrants anesthesia... I was hoping Dr's other than the one I had were more compassionate. I would like to know how to bring a little awareness about this procedure! I felt betrayed, when the chips were already down! No kidding! My subsequent Dr.'s were appalled.....I still am in disbelief that it really happened. It;s kind of like when they used to make women go through labor without any help. Barbaric! Hi! Somehow found your blog - I've been blogging my husband's adventures of fighting CML for the last 2 months. He had the same experience as you with the bone marrow tests. Took 45 minutes. He's not going in again without being knocked out either. We were at M.D. Anderson and saw at least 15 people come in and out of the procedure without a single problem. Not sure why some people have problems and others don't. When my kids go to bed I'm going to catch up on the rest of your story - I started at the beginning! Hey! Thanks so much for stopping by and reading. I am now following your blog, too.Sounds like I was diagnosed just 2 months before Josh. Life sure is unpredictable. I shall catch up on his story tonight as well. Hi Michele - Well that should be your last BMA. Whoo Hoo, Sue! That is awesome! Four years, wow! I do have a new doctor now and he does wish to perform another BMB at the six month mark, but will knock me out. Love that! And yes, the doc doing the biopsy DID say.."For a skinny little thing, you sure have hard bones!" so yes for that I am grateful! Thanks for supporting and reading my blog! My best to you and your continued re-birthdays! Wow, that does sound awful! Mine haven't been that bad, if it were, I'd get off the bed and slug someone! I am puzzled though, I have osteoporosis so you would think my Onc would have an easy time with my BMB procedures, but he doesn't. 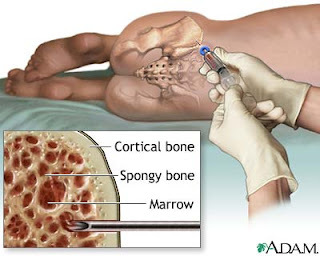 He says my bones are hard too, and he can never get the aspiration because the marrow is too thick. Three BMB's and no fluid. I'm thinking my next BMB should be done by another Onc. Morphine for a headache and nada for BMB, crazy! I know, huh? Never again though! !